At 10.4 x 12.1 x 17 inches the Cuisinart can amazingly make 2 quarts of ice cream. The 13 lb. weight is because Cuisinart only uses high grade materials for their machines and that adds weight. This machine doesn’t require ice and salt to make ice cream so you don’t have to remember to keep salt on hand or buy or use up all the ice you have for your household needs. 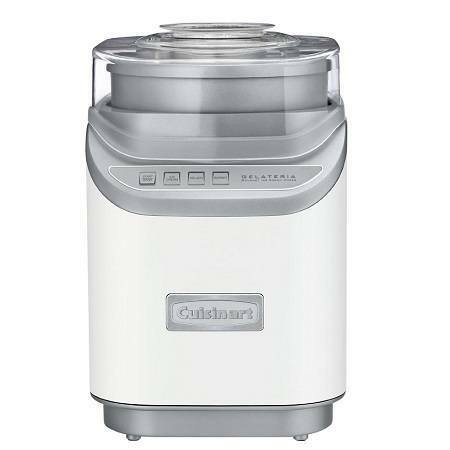 Cuisinart crafts this ice cream maker with plastics that are certified BPA free for the safety of you and your family. The plastic ingredient spout lets you add your favorite ingredients and mix ins with no mess. At $120 it is impressive that this machine has easy to find replacement parts so you are not stuck buying an entirely new machine if you break the lid or the dog chews it up. The Cool Creations has 3 speeds of operation and an easy to use digital control panel. At the same time, you really can just make ice cream with the touch of a button. The machine is thus very easy to use. Many children would be able to operate this machine with little help from you but supervision is recommended until some experience is gained. The sleek design of the Cool Creations makes it blend into any kitchen décor. In fact, the design almost looks like a small bread maker. If you are stuck in rut with the desserts and treats you make at home, an ice cream maker can help you expand your offerings to include ices, sherbets, sorbet, gelato, frozen yogurt, and more! Then of course there are the infinite flavor combinations that you can create by letting your imagination run wild. The fact that you have to freeze the included bowl very well before making ice cream means that you have to think ahead a bit and have enough freezer space to dedicate to the task. If your freezer doesn’t get to 0 F, then it can take overnight before the bowl is cold enough. You have to buy extra bowls and keep them frozen if you want to make multiple batches and ensure that you can make ice cream anytime. For households that have a hard time remembering to fill up ice trays or put things back in the freezer, it might take some getting used to. All in all, this is a pretty basic 2-quart maker backed by the lengthy reputation of Cuisinart. Of course, it also matches a lot of other appliance brands so it is easy to add to your kitchen. The included recipe book makes getting started easy to do. The website for the maker is also very impressive. It is very easy to order parts, download a manual, and get other customer support. Additional recipes and the ones that come with the maker are all easy to access online so if you lose something it is no big deal.